Back during the Beijing Olympics, I fell for Australian swimming sensation Stephanie Rice, and I know that if she were to meet me she’d feel the same way. She must have sensed that because, since the Olympics and her breakup with a fellow swimmer she has been linked to several men but according to her, none of the rumors are true. “Everyone’s always ‘Steph, you need a boyfriend’ and I’m like ‘I know, but apparently I have four’. Believe me, one would be just perfect,” she said. Stephanie also added that while she’s busy with training and being in the public eye, that isn’t stopping her from looking for a gentleman friend. “I can definitely fit it in, that’s not my problem and I’m not making that an excuse,” but it’s not always easy knowing people’s motivation. “It’s hard to tell if people like the idea of (a relationship with Stephanie Rice) or if they really like you,” she said. Well, Stephanie, despite having never met you, I can say that I’m in it for YOU and not your fame. Sure, you have worldwide fame, gold medals, sponsorship deals and seemingly you have it all, but without the proper life-companion, it’s all useless. Let’s take this journey through life together, let’s meet up, say halfway, how about we meet in LA? Also, can someone buy me a plane ticket to LA? And the rest of you, stay away! 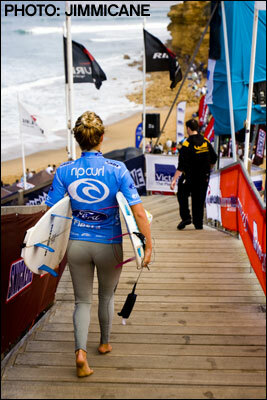 I’m really into surfing recently; well, one particular aspect of surfing, the incredibly hot women who do it. We saw young hottie Alana Blanchard in all her glory, but 9-time Panamanian champion Sonia “Pucha (Sugar)” Garcia can give her quite the battle; which is something I’d pay good money to see. I mean, how can you NOT love a vocation where the women are athletic and hang out in skimpy bikinis all the time, it sounds like heaven to me. The 34-year-old Garcia has captured plenty of titles, and hearts, along her career, although none can be as important as capturing my attention. Let’s go out paddling Sonia! I’m not as up-to-date as I should be with the latest happenings in the surfing world. For instance, I have been INCREDIBLY remiss in not highlighting the talented Alana Blanchard. The 19-year-old from Hawaii has been surfing since she was a child and winning professional competitions since she was 15. In 2003, while surfing with her best friend Bethany Hamilton, a tiger shark swam by and bit off Hamilton’s arm. Along with her father and brother, Alana helped get Bethany to shore and then to the hospital where she was operated on and three weeks later was back to surfing. So, not only is she incredibly hot, but also a good person too! And handy with a tourniquet which is always useful. Even more useful, how hot surfer girls wear incredibly small bikinis all the time and love to show off their bodies. Thank you surf gods. When I was in high school I played on the varsity tennis team as one half of the #1 doubles seed; that means that I’m both good at tennis and play well with others. I think Russian-born and French-naturalized tennis star Tatiana Golovin — who we’ve highlighted before — should keep both those points in mind because, after seeing these photos of her, I can’t get her out of my mind-grapes. Tatiana let’s just get together and hit some balls around, see what happens. Facebook poke me!